Our refurbished Symbol MC5040 units (also produced by Motorola and Zebra) are professionally serviced to meet or exceed factory settings. We sell refurbished Symbol MC5040 barcode scanners and Pocket PC’s. We also service and purchase used Symbol MC5040 devices. Your employees gain the freedom of movement to serve customers and engage in data entry according to the immediate needs of your enterprise via this Symbol mobile computer. Contact us today about buying, servicing, renting or selling Symbol MC5040 gear! Your managers, executives, doctors and salespeople can’t be tied to a desk. To be effective, they have to be on the shop floor, with an important customer, at a patient’s bedside or in the retail aisle. 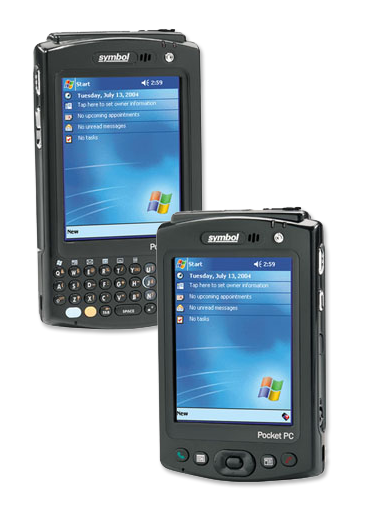 With the Symbol MC5040 (Symbol Mobile Computer) enterprise digital assistant, they have immediate access to the most current enterprise information, using both voice and data communications on a Symbol mobile computer. Your employees gain the freedom of movement to serve customers and engage in data entry according to the immediate needs of your enterprise, increasing your response to changing conditions and helping all employees be more successful in their jobs. Contact us today about buying, servicing, renting or selling Symbol MC5040 gear!